Mining truck tyres are astounding. The sheer size of these massive pieces of equipment are symbolic of the enormity of the mining industry. Symbolism aside though, they are huge, and being huge makes them hard to move when they aren't already attached to the truck. They easily weigh many tonnes (typically around 15 or so), and transporting them is a pain to say the least. It becomes a serious logistical problem, not to mention a safety issue, for miners to move these whenever scheduled replacement or roadside repair is needed. Hyster Big Trucks have been manufacturing heavy duty forklifts designed to move objects ranging from eight through to 52 tonnes. The company explained that these "trucks are at home performing a wide range of tasks on the mine sites across Australia, and a key application for Hyster Big Trucks is the removal and replacement of mining truck tyres". 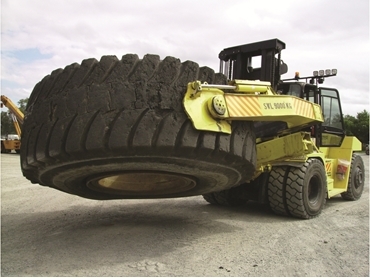 It said that by using a specialist tyre handling attachment which fully integrates with the forklift's controls, these Hyster Big Trucks can rotate, tip, and side-shift the truck tyres, "providing the flexibility needed to align it to the truck and complete changing operation without the forklift driver leaving his cab". According to the company these forklifts include increased visibility; a rugged steel frame and rigid arm construction; a heavy duty rotator with a complete 360 degree continuous action; a forward tipping pad design which allows the forklifts to set the tyre down flat; internal rather than external hoses to prevent damage; unitised control valves with individual test points for a faster fault diagnosis; and "the thinnest profile arms for hard to access tyres and the ability to handle tyres ranging from 1.6 to 4.1 ­metres in diameter and up to 1.885 metres wide". Hyster went on to say that "the safety implications of this fully automated solution can not be overstated; neither can its benefits for mining truck utilisation times. "Both coming to reduce workshop or roadside repair risks while getting the truck moving again as quickly as possible has direct effect on the bottom line profit."